We are always trying to improve things and extend our reach as a company. With everything going on, it can be hard to inform all our customers and followers. Here is a quick summary of what’s been going on with us here at Turnbull Manufacturing. The Limited Edition Engraved Turnbull 1886’s. Every so often Doug will go into his “lab” and come up with something new and unique for his firearms. He has come up with several ideas, like the Turnbull BBQ 1911’s, the Turnbull color cased AR series, and now the Limited Edition Engraved Turnbull 1886’s. 4 unique designs have been made and only one of each design is available. Each design features its own unique engraving pattern, the scroll, #6, #9 and modified #10 patterns. Each of these patterns have been modeled after classic Winchester engravings. The receiver on these rifles are still in the white and can be color cased or blued. To learn more about these amazing rifles, see their listing in our rifle inventory or stop out to see us at the NRA Convention May 20-22. Turnbull has bought a new collection of handguns. A big question we are always asked is; “Do we buy guns?” and the simple answer is “yes”. We just got back from Florida where we met with an individual who was looking to invest in a new venture and wanted to fund this new investment by selling his collection of vintage guns. After careful inspection, Doug Turnbull bought the person’s gun collection. This collection consisted of several vintage rifles and handguns. These guns will be made available in our firearm inventory within the next few weeks. 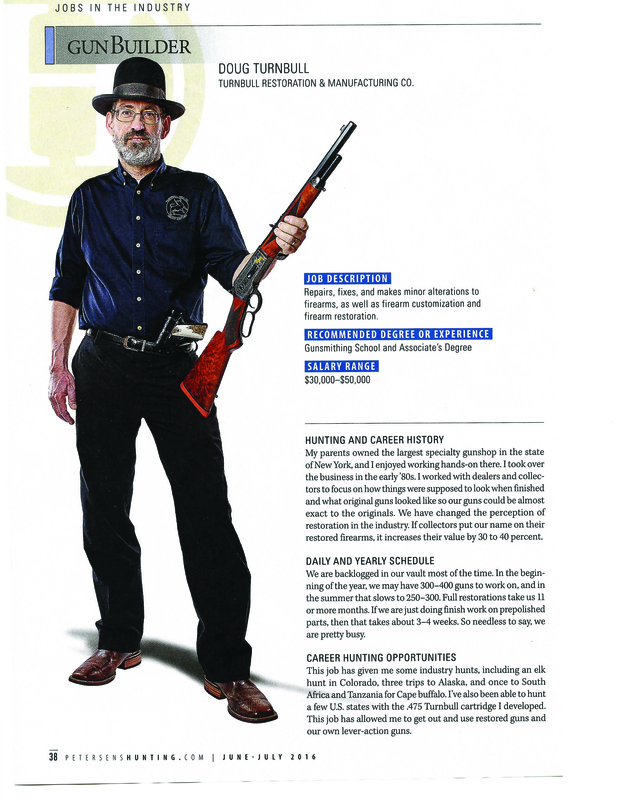 Doug Turnbull in Petersen’s Hunting Magazine. If you flip to page 38 of the June/July 2016 issue of Petersen’s Hunting magazine, you will find an article on Doug Turnbull. The focus of the article is around the “Gun Builder”. Doug was interviewed and asked questions about his profession and the jobs he employs. The article is meant to give a snapshot of what it’s like to work restoring guns. Several other professions are listed as well. Professions like videographer, Winchester product manager, and commercial photographer. The focus for these sections is jobs in the industry. You can pick up a copy of this issue at most convenient stores or online. New shows on the horizon. We have many new shows coming up in the near future. We are particularly excited about the Bite the Bullet BBQ coming up on June 4th. This is an event we attended last year and it was a ton of fun. There will be great food, music, giveaways and guns. We are also looking forward to the NRA Convention that starts on May 20th and runs through May 22nd. At NRA we will be showcasing our 2016 Turnbull 1911’s as well as answering questions about potential restorations. If you’ve been waiting for us to stop out at a show near you, please give us a call or email us your suggestion. We are always looking to attend new shows. Turnbull to enter the Maryland market. For the last few months, we have been working to get our Turnbull 1911’s approved for sale in the state of Maryland. We have a lot of great customers we want to be able to provide our 1911’s to that live in and around the Maryland area. Going through the state approval process is just our first step in bringing our Turnbull manufactured firearms to Maryland. We should have an update in the upcoming months. For a list of Turnbull registered dealers in your area, please visit our Locate a Dealer page or call us at 585-657-6338.